Keeping our devices charged has become a virtual nightmare. One here, one there, wrong size, cord not long enough…it’s maddening. Tech Candy is here to help with their 3-in-1 Charging Cable and Car/Wall Power Adapter. 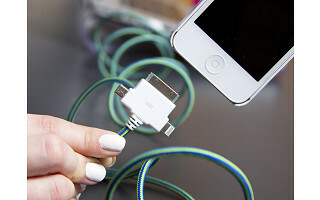 Designed by April Mraz and Cherie Stine, founders of Tech Candy accessories, the cable can be used with all iPhones, iPads, iPods, Kindles, Nooks, Samsung, and other Android Smartphones. At 6 feet long, it's double the length of standard cords providing maximum reach and ease of use. It can charge 3 ways with 30-pin, 8-pin, and Micro-USB connections. Made with colorful woven fabrics, the Get Cord-inated cable provides streamlined cord control for devices at home or work. The Car/Wall Power Adapter works both in your car AC/DC outlet and works in wall outlets, too. It's ideal for travel because it folds into its own case to keep the charging connections clean, dust-free and easy to carry. Keeping our devices charged has become a virtual nightmare. One here, one there, wrong size, cord not long enough…it’s maddening. Tech Candy is here to help with their 3-in-1 Charging Cable and Car/Wall Power Adapter. 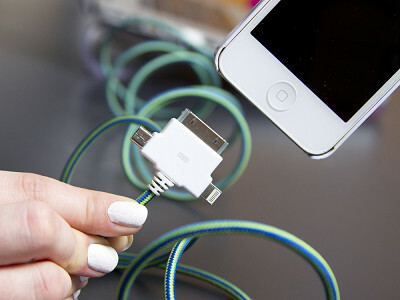 Designed by April Mraz and Cherie Stine, founders of Tech Candy accessories, the cable can be used with all iPhones, iPads, iPods, Kindles, Nooks, Samsung, and other Android Smartphones. At 6 feet long, it's double the length of standard cords providing maximum reach and ease of use. It can charge 3 ways with 30-pin, 8-pin, and Micro-USB connections. Made with colorful woven fabrics, the Get Cord-inated cable provides streamlined cord control for devices at home or work.